I came to Geoff Dyer via Yoga For People Who Can’t Be Bothered To Do It, his 2003 collection of creative nonfiction in which Dyer recounts a decade of listlessness, wanderlust, and his personal search for peak experience through both travel and hallucinogens. White Sands is a similar collection. Things have changed for Dyer in the intervening 13 years since he described himself as a man who “lives in London where he spends much of his time wishing he lived in San Francisco.” For one thing, mind-altering drugs are absent from his latest stories; for another, he and his wife now live outside of Los Angeles in Venice, California. 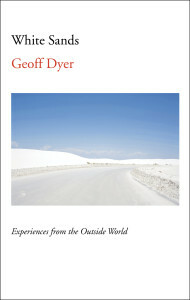 Nevertheless, White Sands feels similar to Yoga as readers again accompany Dyer on travels both geographical and psychological. Dyer draws the metaphor out further, concluding the Adam and Eve’s departure from the Garden of Eden was likely voluntary, that they went seeking another garden somewhere else, a conclusion easy to imagine being drawn from someone who is frequently seeking a better experience elsewhere. A dog-mushing trip goes horribly wrong for Dyer (but it makes for an hilarious story for us), and the couple subsequently bails on a snowmobiling trip, opting instead to hunker in their room to await their return flight. Dyer and his wife visit the Watts Towers, enormous artistic structures built solely by Italian immigrant Sabato Rodia in his own backyard in the Los Angeles’ Watts’ community over a period of more than 30 years. Dyer finds Rodia’s undertaking to be jazz-like in its improvisation – the towers having been built entirely of found objects and scrap rebar that Rodia had foraged for himself – which is appropriate given not only because Dyer’s proclivity toward jazz and jazz figures, but because one of those jazz figures, Charles Mingus, was himself fascinated by the Watts Towers, mentioning them in his autobiography. The Watts Towers spur myriad cultural references – from Mingus’s mentions to descriptions of the towers in Don DeLillo’s Underworld, a comparison to the English cathedrals of his youth, and back to an earlier Heideggerian discussion of effect and cause and the idea of the construction of the towers having caused Watts itself to be built around them. Dyer even references a New York Times reporter who, within a year of the towers’ construction, called them “a dream of how things should have been.” That reporter was Thomas Pynchon. One of the great hallmarks of Dyer’s writing is his ability to riff jazz-like on a single topic, no matter how small or mundane. Parking, for instance. It is ironic, this ability of Dyer’s to reveal the transcendent within each mundane moment, because one of his single most defining characteristics is his inability to fully inhabit a moment without lurching off mentally for the next experience to be had. But it is exactly this perceptive illumination of the mundane combined with his endless capacity for well-turned rumination that keeps me returning to Dyer’s prose. Formerly About.com’s contemporary literature guide and a Kirkus Reviews contributor, Mark is the founding editor of Run Spot Run. He was also progenitor and co-conspirator behind Infinite Winter, a ridiculous thirteen week dive into Infinite Jest he'd love an excuse to reprise. He typically refrains from referring to himself in the third person.